As Adobe Flash and Microsoft Silverlight duke it out over their plugin-based, HTML-alternative web platforms, Apple is using Gianduia, its new a client-side, standards based framework for Rich Internet Apps, to create production quality online apps for its retail users. Apple introduced Gianduia last summer at WOWODC (World of WebObjects Developer Conference), an independent event scheduled near the company's own WWDC event in June. It is likely that more information will surface at this year's WOWODC and WWDC events. Like Cappuccino, Gianduia takes a Cocoa-inspired name (Cocoa is itself a Java-inspired name) to describe its role as a way for Cocoa developers to bring their skills to rich online applications built using web standards, with no need for a proprietary web plugin like Flash or Silverlight. While the emerging new support for Rich Internet App features in HTML5 is often pitted competitively against Flash, Gianduia, SproutCore and related frameworks demonstrate that sophisticated web apps are already possible using existing web standards and without web plugins. 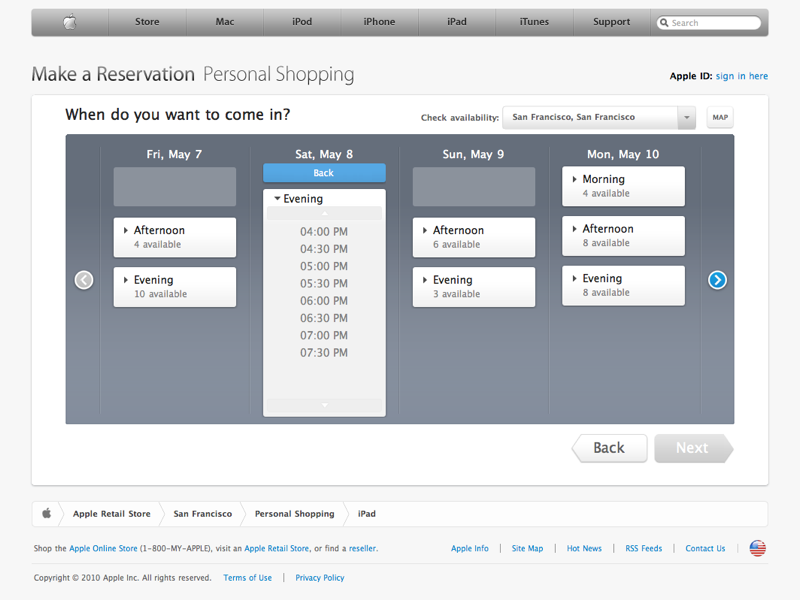 Apple Retail has actually already been using Gianduia to create web app clients (which plug into the company's WebObjects-based services), for a variety of popular programs over the last several months, including its One-to-One program, iPhone reservation system, and its Concierge service for Genius Bar reservations and Personal Shopping (shown below) programs. On page 2 of 2: Adobe running out of AIR.